In earlier times the Sangeet would last for 10 days, celebrating up until the wedding day – however over time this tradition boiled down to a one day function in order to fit all of the wedding events into one week. The Sangeet ceremony takes place two or three days prior to the wedding, before the Mehndi ceremony. This celebration includes dances performed by relatives and friends of the Bride and Groom, songs by the elder female members of the family sung in unison with the bride as the focal point, and an open dance floor to commemorate the festivities for the following days. The event takes place at the Bride’s home or a separate banquet hall, where the Bride’s family welcomes the Groom’s family by singing Suhaag, a traditional folk song, to the tune of the Dhol. 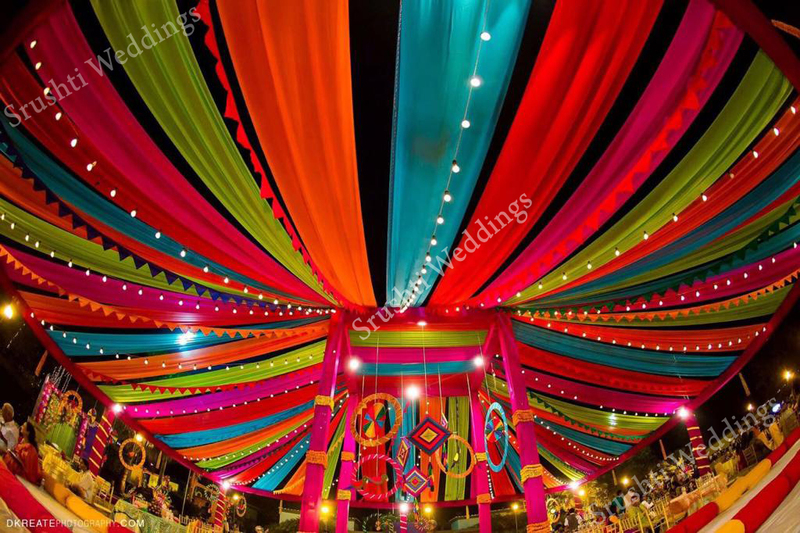 Make your sangeet more colorful with our Srusti Weddings.We love to work with you..! SRUSHTI WEDDINGS – is a leading Wedding Planner company in Andhra Pradesh, skilled in the areas of complete event management, entertainment, celebrity & artist management, stage designing & fabrication, video and photography etc., It is a leading one of A.P’S premiere Corporate Entertainment Event Companies since 2001. © Copyright © 2018.All right reserved by Srushti Events.